Guitarist Vernon Reid, bassist Jamaaladeen Tacuma and drummer G. Calvin Weston are Free Form Funky Freqs. 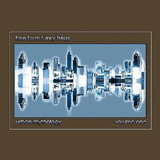 Their debut, Urban Mythology: Volume One, is an impromptu session unveiling new possibilities in the no-mans-land between improvisation and popular music. With diverse jazz and rock backgrounds, the trio uses their collective experience to add their own spin to the dreaded "f" wordfusion. Vernon Reid's recent forays with DJ Logic as the Yohimbe Brothers, and a continuing role as producer/side-man to James "Blood" Ulmer have raised his profile considerably since the demise of his band Living Colour and his formative days with drummer Ronald Shannon Jackson's Decoding Society. Weston and Tacuma both served in Ornette Coleman's Prime Time, but these three had never played together as a trio. Improvising rather than using pre-written material, they use their encyclopedic knowledge of popular music as the anchor for malleable, free ranging jams. With only two unrehearsed live shows under their belt, this recording documents their third ever performance together. Based on the success of those gigs, Reid took the trio into the studio to capture their newfound rapport. Recorded live, with no overdubs, they demonstrate an amazingly fluid sense of synchronicity, constantly transforming the tunes in real time. The epic opener, "A Tale Of Two Bridges" is definitive, seamlessly shifting through an endless cycle of moods, tempos, rhythms and textures over the course of twelve minutes, ranging from thunderous stadium rock to surreal alien soundscapes. The trio grooves hard on funky numbers like "Don Cheadle," the deconstructed disco of "Nappy Hour" and the guitar-synth dominated "Doing Within." Bursting at the seams, "Over And Under" is relentless, with blistering bass, palpitating drums and eviscerating guitar. "A Lost Way Found" shows euphonious restraint, exploring droning space rock, while the Southern-fried "Chump Champ Chunk" doles out hard-edged cyber-blues. "Street Corner Prophecy" closes the album on a futuristic note, surging with fractious enthusiasm. Using loops and EFX units that expand his sound to orchestral levels, supported by a killer rhythm section, Reid shreds his fret board unfettered, offering some of his most incendiary playing on record. A rollicking affair, Urban Mythology: Volume One is an intense sonic trip for those willing to make the journey. Track Listing: A Tale Of Two Bridges; Don Cheadle; Ghost Sign Crossroad; Over And Under; A Lost Way Found; Nappy Hour; Chump Champ Chunk; Get Your Legs On; Doing Within; Street Corner Prophecy. Personnel: Vernon Reid: guitar, guitar-synth, laptop; Jamaaladeen Tacuma: bass; G. Calvin Weston: drums.